alaTest has collected and analyzed 24 reviews of Panasonic TX-32CS510B. The average rating for this product is 4.7/5, compared to an average rating of 4.3/5 for other products in the same category for all reviews. Reviewers really like the price and durability. The design and image quality also get good opinions. Opinions are divided on the remote control, and some have doubts about the color and sound. We analyzed user and expert ratings, product age and more factors. Compared to other products in the same category the Panasonic TX-32CS510B is awarded an overall alaScore™ of 89/100 = Very good quality. 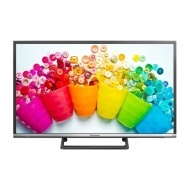 The Panasonic TX-32C510B is a bog-standard 32-inch TV with just a Freeview HD tuner. That's reflected in the low price, but so is the mediocre sound quality. Can this Panasonic TV excel elsewhere in our lab? Read on to find out. Easy to set up and programme hand set well designed and understand. Fast channel change. All round a very good tv as always from panasonic. Some difficulty in getting the colour balance right. The factory setting do not seem to be correct foe this unit.